Chhath, the festival in which devotees worship the Sun God. During the four-day festival, celebrated especially by people from Mithila region, devotees worship and make offerings to the rising and setting sun wishing for prosperity, happiness and longevity of their family members. During this festival, various delicacies are prepared. Likewise, purity and cleanliness are strictly maintained. 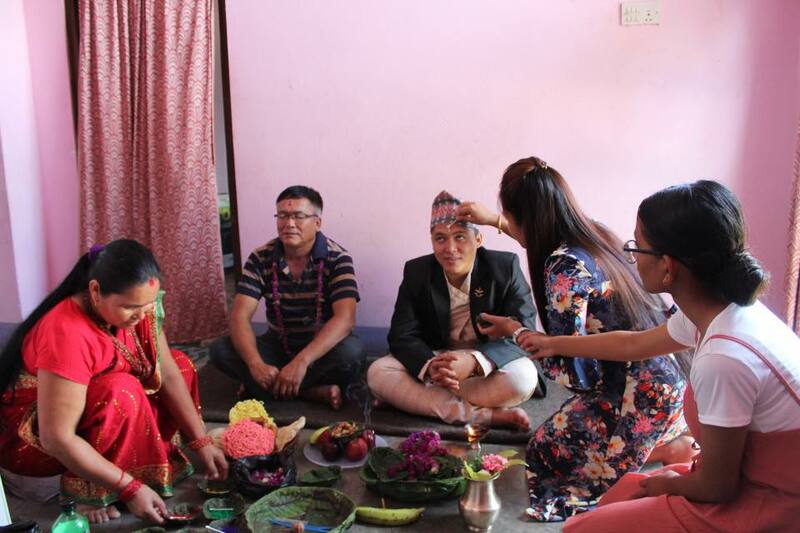 The festival begins on Sunday marked by Nahai Khai, Kharna, Sandhya Argha and Bihani Argha rituals respectively on the four following days before the festival concludes on Wednesday. The name of the festival symbolises its day of occurrence, as ‘Chhath’ refers to ‘sixth’. 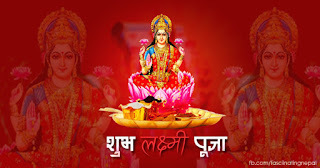 There exist different myths as to how Chhath began, People started celebrating Chhath since ancient times, showing gratitude to the Sun God for sustaining life on Earth. Each activity of this festival represents a relationship between human life and nature. During Chhath, the sun is worshipped as the protector of life. Devotees worship first the setting sun and then the rising sun. 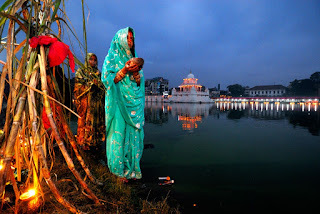 Water has a special place in nature as well as in Chhath celebrations. Cleaning up water sources also contribute to nature conservation and sustenance of healthy life. The festival also attempts to end caste discrimination and envisages bringing social harmony among peoples of different caste groups. Likewise,Chhath gives priority to sand and bamboo-made materials, which reflect the main occupation of people with low economic status. Tihar is one of the most important festivals for Hindus in Nepal. 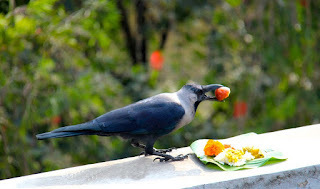 The festival of Tihar takes place in late autumn and lasts for five days. This festival is also called the festival of lights. It is a time when all the houses light oil lamps, and the city is full of lights and decorations. This festival is about worshipping different animals such as the crow, the dog, and the cow. During Tihar, the people also worship their brothers and sisters and the goddess of wealth, Laxmi. On the first day of the festival, people worship crows. Every family cooks a delicious meal in the morning. Before they eat, each member of the family puts some food on a plate of leaves and places it outside for the crows to eat. People believe crows are the messenger of the Lord of Death. They worship crows to keep sadness away. The second day, people worship dogs. They decorate dogs with garlands of flowers around their necks. They give dog’s delicious food and put a red tika (a special powder) on their foreheads. They even do this to stray dogs. It is a day to respect all dogs. They pray for the dogs to guard their homes. Dogs with garlands of flowers can be seen everywhere. The third day is the most important day of the festival. Early in the morning, people start to worship the cow. The cow is the symbol of wealth and is the most holy animal for Hindus. 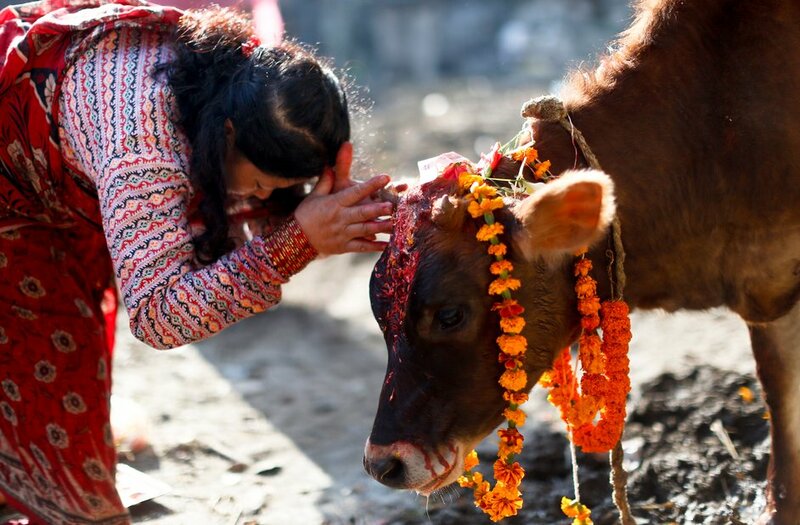 They put tika on the cows’ foreheads and a garland of flowers around their necks. They give the cows nice things to eat. People place the cows’ manure in different parts of their houses. Later, in the evening, they worship the goddess Laxmi. If people please the goddess, she will give them wealth. People clean and decorate their houses. They put oil lamps in every door and window. A female member of the family performs a special ceremony or puja. She then puts a red mud footprint on the floor entering the home and makes a trail to the room where the family worships the goddess. In this room, there are pictures and an icon of the goddess. There is also a money box where each year the family puts money away for the goddess. In the evening, group of people go from door to door of their neighbors’ homes and sing songs of the goddess. They receive gifts in return. The fourth day is a little different. The things people worship on this day depend on their cultural background. Most people worship the ox. They put tika on the oxen and a garland around their necks. They also give them delicious food. Other people make a small hill out of cow manure, put some grass on it, and perform a special ceremony, or puja, on it. Yet other people worship themselves. The fifth day is the day of brothers and sisters. Sisters wish their brothers long life and prosperity. If you do not have a brother or sister, you can make one of your relatives or friends a brother or a sister. On this day, sisters will perform a puja and apply a special tika on their brothers. Then they put garlands around their brothers and give them special gifts of food. Brothers in return honor their sisters; they put garlands around their necks and give them gifts of clothes and money. This festival finally ends after five days of cooking, decorating, eating, singing, dancing, shopping, relaxing, gift giving, and worshipping. There is no doubt that Tihar is the most popular festival in Nepal. Tihar, one of the great celebrations in the Hindu calendar, is a five-day autumn festival generally known as the festival of lights. Each day has its own focus, and specific observances vary from one denomination of Hinduism to another. Regardless of regional and denominational differences, Tihar is a period of gift-giving, storytelling, and recognition of the relationships humans have with all things. 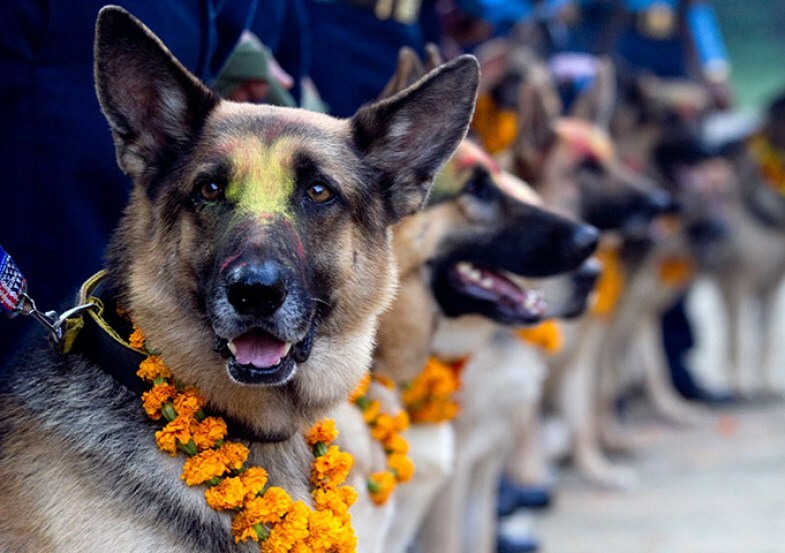 In Nepalese Hinduism, Kukur Tihar is a day devoted to the celebration of dogs. Similar to other Tihar observances, lamps are lit at night during Tihar. The festival of lights celebrates the triumph of light over darkness, of knowledge over ignorance, and the dissolution of barriers that separate humans from authentic experience of the world. Nepalese Hinduism is unique in dedicating the second day of Tihar, Kukur Tihar, to the worship of dogs. Kukur Tihar, or Kukur Puja, is the second day of Tihar, during which dogs are honored. Dogs are especially important to Nepal’s Hindu practitioners. During day two of Tihar, Kukur Tihar, the role of dogs in human life and throughout history is celebrated. In the Rigveda, one of Hinduism’s most ancient texts, Samara — the mother of dogs — assists Indra, the ruler of heaven, in retrieving stolen cattle. Hindu tradition holds that a dog is the guardian and messenger of Yama, the lord and judge of the dead. A dog is also said to guard the gates of the afterlife. Indra refuses to allow Yudhishthira's dog into heaven. Yudhishthira refuses to enter heaven without his dog. At the close of the Mahabharata, the king of righteousness, Yudhishthira, refuses to enter heaven without his devoted dog. The dog is revealed to represent the concept of dharma, the path of righteousness. During Tihar, each day is devoted to a honoring a different concept or entity: crows, dogs, cows, oxen, and fraternal relationships, respectively. On the second day, Kukur Tihar, all dogs are recognized, honored, and worshiped. During Kukur Tihar, the mythological and real relationships between humans and dogs constitute the day’s major focus. A garland of flowers is draped around the neck of every dog; not only those with homes, but strays as well. This beautiful dog wears a mala, or flower garland, around the neck during Kukur Tihar. This floral necklace, called a mala, is a mark of respect and dignity. It announces the wearer as important, and symbolizes the prayers that go with the dog. On Kukur Tihar, a red mark is applied to the forehead of each dog. 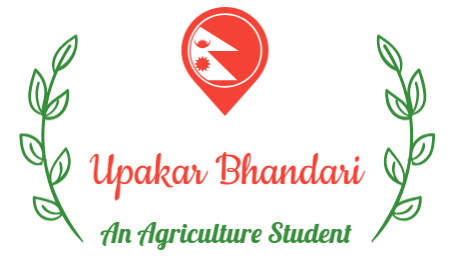 In Nepal, this mark is called the tika, a paste made from abir — a red dye powder — along with rice and yogurt. The tika is applied in a single stroke on the forehead upward from the eyes. A dog in Nepal makes his way down the street with a tika on his forehead. Like the mala that garlands the neck, the red tika marks the dog as both a devotee of the righteous path and as an object of devotion. The tika imbues the dog with an air of sacredness and acts as a blessing to those who encounter the dog during Kukur Tihar. Prayers and flowers are certainly nice, but as far as dogs are concerned, their favorite part of Kukur Tihar must be the food. On the first day of Tihar, Kaag Tihar, food is arrayed on the roofs of homes as offerings to crows. On the second day, food offerings are put out for dogs in the home, as well as for strays in the streets. These food offerings take a variety of forms. Depending on the celebrant, the dog’s treats may include milk, eggs, meat, or high-quality dog food. Some may even offer dogs a bit of sel roti, a deep-fried confection similar to a donut. This is a day when dogs have the best of everything. This is a very general overview of Kukur Tihar. While its origins are traced to Nepalese Hinduism, variants of the day of the dog are celebrated by denominations of Hinduism and Buddhism across the world. Kukur Tihar honors dogs in all of their aspects: as guardians, companions, and friends.